Situated in the northeast of England, Newcastle International Airport operates services to mainland Europe and domestic services to destinations throughout the United Kingdom. Our Newcastle International Airport guide includes contact details and information on airport facilities, transport and accommodation options. A £70 million investment in airport facilities is due to be completed in 2016, with projects including new car parking and the construction of a rail link connecting to the mainline network. Most recently, works have been completed on the airside area of the terminal, resulting in a new layout and facilities for departing passengers. The information desk is located on the ground floor of the terminal and is open 24 hours a day. The A1 connects with the A696, which leads directly to Newcastle International Airport. From Newcastle city centre, take the A167 northbound and continue along the A696, following signs for the terminal. The journey time is approximately 10 minutes. 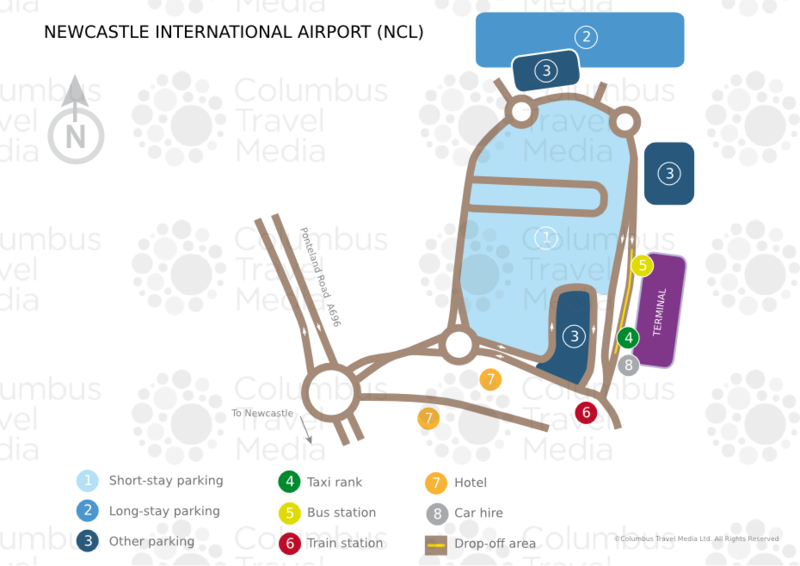 Newcastle International Airport is situated 10km (6 miles) northwest of Newcastle. Bus:Several bus routes run between Newcastle International Airport and Eldon Square Bus Concourse in the city centre (journey time: 30 minutes; fare: £3.20), including buses X77, X78 and X79. Taxi:Airport Taxis (tel: +44 191 214 6969; www.airport-taxis.co.uk) operates taxi services from a desk within the terminal building. Taxi fares into the city start at around £20 – a discount applies for online pre-bookings. Chauffeured executive cars, MPVs and luxury coaches are also available at the airport, and are offered by Professional Chauffeur Services (tel: +44 845 223 2000; www.pcslimited.org). Metro:The Tyne and Wear Metro rail system (tel: +44 191 202 0747; www.nexus.org.uk) links Newcastle International Airport directly with 60 other Metro stations in the Tyne and Wear region, along with connections to mainline rail services at Newcastle Central Station (journey time: 25 minutes; fare: £3.20). A bank and ATMs are available. Bureaux de change services can be found both pre- and post-security. There is a café, a pub and a bakery landside. A choice of new restaurants and cafés, as well as a wine bar and real ale pub can be found airside. There is a newsagent and a convenience store before the security area. Shops selling fashion, sportswear, accessories, books and magazines, electronics and other items are available airside. Duty-free is available for passengers travelling outside the EU: duty-free goods can be pre-ordered online via the airport's website. Left-luggage facilities are available landside. Lost property services (tel: +44 191 214 3367) are available 24-hours a day. Porters are available to assist with luggage, free of charge. Among the facilities at Newcastle International Airport are baby care rooms, children's play areas and an entertainment area with children's rides and video games. Other notable facilities include a travel agent, a pharmacy in Departures, free bicycle parking and a 24-hour chaplaincy and prayer room. The Aspire Lounge is open to all passengers for a fee, with credit card telephone, fax and internet facilities available. There is also a British Airways Lounge equipped with a business centre area. For conference facilities, contact the nearby Doubletree by Hilton Newcastle International Airport hotel (tel: +44 1661 824 266; www3.hilton.com), which offers five meeting rooms with capacity for up to 150 delegates. Paid-for Wi-Fi internet access is available throughout Newcastle International Airport (the first 45 minutes of which are free of charge). There are also several internet-linked computer stations in the departure lounge. Public telephones are located throughout Newcastle International Airport. Disabled toilets, lifts and reserved car parking spaces are provided for those with disabilities. There are wheelchairs and specialist vehicles within the terminal to assist passengers when boarding the aircraft. A TDD phone for hearing-impaired passengers is available in the main concourse opposite the information desk; there is also an induction loop system in various areas, and a Minicom telephone at the information desk. Assistants are on hand to help, and a number of airport staff are trained in the use of sign language. Any passengers who may require additional assistance are advised to contact their airline before travelling. Both long- and short-term parking rates are offered, with a 24-hour courtesy shuttle bus operating between the long-term car park and the terminal – the short-term car park is immediately opposite the terminal. A direct telephone pre-booking service and an online booking service are available (tel: +44 191 214 4341). Avis, Budget, Europcar, Hertz and Interrent are represented at Newcastle International Airport, with desks opposite Domestic Arrivals on the ground floor of the terminal building.